Ghostbusters and How To Train Your Dragon sets are the first foray into licensed toys from the classic brand. Invented by German Inventor Hans Beck in 1974, Playmobil has been a toy store mainstay for decades, yet it’s never reached the height of popularity enjoyed by the likes of Lego. That could change this year, as Playmobil gets into the licensing game with Ghostbusters and How To Train Your Dragon. Even if you don’t know the name, you’ve almost certainly seen a Playmobil figure. The splayed leg stance, the round, noseless heads, the cheery smiles shared by bloodthirsty viking and construction worker alike—these are iconic Playmobil features. Blind bag toys have been very good to Playmobile. But while other building toys like Lego, Mega Blocks and K’nex have been licensing the hell out of everything possible for years, Playmobil’s largely kept to itself, releasing more generic themes or attempting to jumpstart its own featured properties, like the Super 4 animated series, featuring characters crossing over from various Playmobil worlds. But now Playmobil is taking the licensing plunge, starting with two very big properties. Launching in May of 2017, Playmobil’s Ghostbusters line focuses on characters and scenes from the classic horror comedy. The star of the line is the Firehouse ($69.99), a large set filled with tiny details for fans and lots of play opportunity for kids. I forgot to snap a wide shot. Enjoy the lifestyle image. The set is very detailed for a Playmobil toy. Check out the newspaper Spengler is holding in the shot below. We’ve got the most lifelike Rick Moranis toy ever made. While Janine seems a bit too eager to answer that phone, especially in the face of a hot pizza. It’s a huge set at a great price. 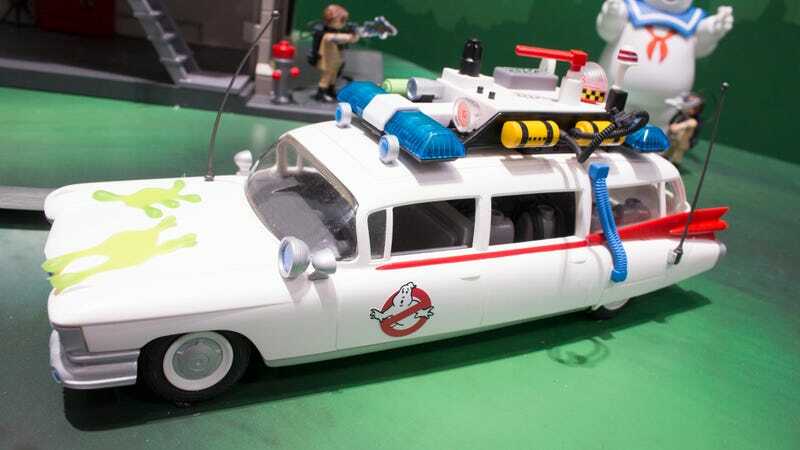 The obligatory Ecto-1 seems a bit pricey by comparison at $45, but it’s also wired for lights and sound. One of the better Stay Puft Marshmallow Men I’ve seen runs $19.99. The $17.99 Venkman and Terror Dogs set also includes a possessed Dana, plus it’s called Venkman and Terror Dogs. I would buy anything named Venkman and Terror Dogs. There is no escaping Slimer and his string of wieners. While the Ghostbusters Playmobil line taps into adult nostalgia, the How To Train Your Dragon sets, due out in August, are purely for children. And for adults who love those damn dragons. Okay, they are for everyone. Vikings have long been a Playmobil staple, so it’s not too much of a jump to adds giant, colorful dragons to the mix. My personal favorite is Astrid and Stormfly ($29.99). Though I suppose most people are all about Toothless and Hiccup ($34.99), the latter of which doesn’t even need to be in frame because LOOK AT TOOTHLESS. The first sets are based on How To Train Your Dragon 2, so we get Dragon and Thunderclaw ($29.99), who seems a bit smaller than I remember him. But then everything looks small when compared to the massive Berk playset. It’s $120 worth of massive viking island. Were I even more financially irresponsible than I already am, I’d buy it just for this little guy here. But I am not, and require at least one video of a Playmobil rep rotating the set. Playmobil will never stop making the classic sets it is known for, but these lovely licensed sets from a pair of beloved properties will go a long way towards getting Playmobil known even better. I got my first Playmobil toy, an Indian, as a Happy Meal toy from McDonald’s way back in the early 80s, when they were first being introduced to the United States. It does big-child heart good to see them kick things up a notch some three and a half decades later.